If you want a cat with the high spirits of the Abyssinian but with luxurious fur -- a cat that resembles a fox with its pointed muzzle, alert ears, and intelligent, brilliant eyes -- look no further than the Somali. With all the virtues of the Aby plus a gorgeous semi-long coat, the Somali is a beautiful and animated addition to any household. The Somali first made its American appearance in the 1950s when longhaired kittens began appearing in Abyssinian litters. The gene governing long hair is recessive, which means one copy of the gene must be inherited from each parent for a kitten to have long hair. The gene can be passed on for generations without appearing, so no one knows exactly when or where the gene originated. Two schools of thought exist about the origin of the gene. Some believe that it was introduced when European breeders bred longhaired cats with Abyssinians to save the Aby from extinction after the world wars had decimated the breed. Others believe that the Somali is a gift from Mother Nature, created by spontaneous mutation. The idea that the Somali arose from the Abyssinian lines without help from other breeds is popular with many Somali fanciers. However the longhair gene got there, early Abyssinian breeders were less than thrilled with longhair kittens cropping up in their Aby litters and quietly sold them as pets. It wasn’t until the 1960s -- the decade of flower power and long, flowing tresses -- that fanciers finally began seeing the appeal of a longhaired Abyssinian. Breeder Evelyn Mague spearheaded the Somali movement and worked hard to gain acceptance for the longhaired rebels. Mague came up with the name “Somali” since Somalia borders Ethiopia, the country formerly called Abyssinia for which the Abyssinian was named. The Somali is no more from Somalia than the Abyssinian is from Abyssinia, but the name has a nice ring to it. In 1972, Mague founded the Somali Cat Club of America and began bringing the Somali enthusiasts together. Gradually, the breed won over the opposition and steadily gained popularity. Today, the Somali is recognized by all North American registries. 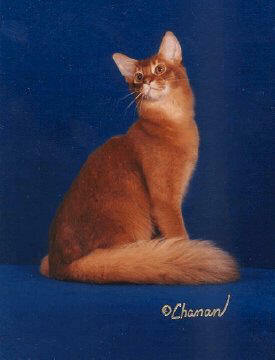 Although essentially a longhaired Abyssinian, the Somali has characteristics all its own. The most notable difference, besides fur length, is size; Somalis are larger than their Aby relatives. Dense fur adds to the appearance of size. Their bodies are long, lithe and graceful with firm muscular development. The head is a modified wedge shape adorned with large, pointed, alert ears. The large, expressive, almond-shaped eyes gleam like brilliant gold or green jewels in a rich setting of fur. The Somali’s medium-length coat is soft, silky and baby-fine. The hair is longest around the neck and breeches; the mane gives the Somali the appearance of a miniature lion. A luxurious fox-like brush adorns the tail. Somalis come in the same colors as the Aby: ruddy, red, blue and fawn. All associations except TCA accept these colors; TCA accepts only ruddy and red. Some associations such as TICA and AACE also accept silver. This color is controversial, however, as some breeders believe that the inhibitor gene responsible for the silver effect will ruin the ruddy coloration. The traditional Somali was recently accepted by TCA. According to traditionalists, the body and head type of the Somali began to change around 1983, when the other cat associations began supporting a more tubular and thin body type and an extreme wedge-shaped head. The traditional Somali has a more robust, muscular body and a head that’s less extremely wedge-shaped and fine-boned. Although the Somali’s beauty first attracts people, its personality turns fanciers into fanatics. Although not lap cats, Somalis are people-oriented and devoted, and want to be involved in every aspect of your life. Open a drawer, and your Somali will be there to peer in. Sit in front of the tube, and your Somali will be there for a pet and a purr. Don’t get a Somali if you want a cat that resembles a furry doorstop, however. Like the action-packed Aby, the Somali is energetic and animated, and possesses a sense of humor and a love of play. Somalis love to race around the house, opening cupboards with their agile paws and generally getting into mischief. They are also intelligent, which contributes to the mischief making. They also tend to be determined cats; once they get an idea in their furry little heads, there’s no deterring them. “Tenacious” is the word most used to describe the Somali.